2D/1N Backpacking to the Magical Nusa Penida Calling out to the fearless and fun travelers out there, this trip will definitely make its way to your bucket list. We will strip everything to a minimum yet you will experience so much more! With so many fascinating spots to explore, this island is surely a haven waiting to be discovered. So bring your friends and excitement, and let us take you to your next epic adventure. 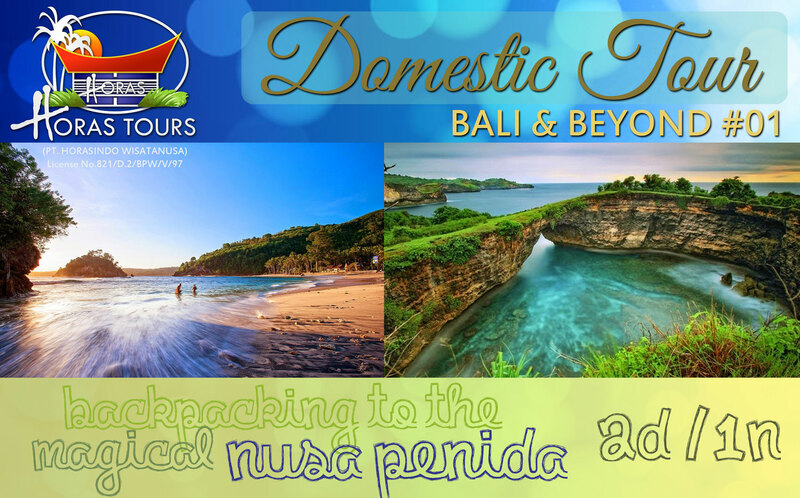 Day 1: Bali – Nusa Penida (Crystal Beach & Atuh Beach) Rise up early for an unforgettable journey to the magical island Nusa Penida! We’ll be taking morning speedboat ride for approximately 30 minutes. Then, we will take you directly to our favourite snorkeling site in Nusa Penida. You will be greeted with some of the most awe-striking tropical fishes and soft corals in this part of the world, not to mention the welcoming villagers on the way. Lunch at the local restaurant before we scooter to the Crystal Beach. True to its name, the water is beautiful crystal clear that you might think you’re in a swimming pool! Come dawn, experience the excitement of camping underneath billions of stars by the Atuh Beach. We’ll build our tents by hand and sing the night away by the bonfire! It will be a night to remember! Day 2: Nusa Penida (Natural Pool & Pasih Uug) As the sunrise kisses your sleepiness away, get ready to explore more of the island’s beauty. We’ll journey to a hidden natural pool with a million-dollar-view of the vast Indian Ocean. Tucked away in one of Nusa Penida’s cliff, the spot is so well hidden, it feels like a private pool! The track may be arduous with plenty of steep steps, but all will be worth it as you plunge into the fresh water delight and feast on the blue oceanic view. If time permits, we will treat you with a visit to Broken Beach (Pasih Uug). Here you will enjoy the magnificent view of the ocean and tunnel-shaped-cliff from up above, and you may even get to spot one or two manta rays in the water. As we approach afternoon, we’ll scooter back to the harbor to catch the boat ride to Bali.